Screen Door, Bronze Aluminum, 36 x 80 x 1-In. Promo Series Screen Door, Gray Aluminum, Adjustable, 31.25 x 79.75-In. Promo Series Screen Door, Gray Aluminum, Adjustable, 35.25 x 79.75-In. 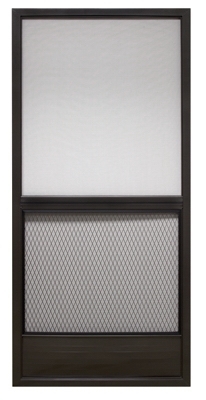 Capri Series Screen Door, Bronze Aluminum, Adjustable, 31.25 x 79.75-In. Capri Series Screen Door, Gray Aluminum, Adjustable, 35.25 x 79.75-In. Provencial Series Steel Screen Door, Bronze, Adjustable, 35.125 x 79.75-In. Provencial Series Steel Screen Door, White, Adjustable, 35.125 x 79.75-In. Screen Door, White Aluminum, 32 x 80-In. Screen Door, White Aluminum, 36 x 80 x 1-In. Screen Door, Mill Finish Aluminum, 36 x 80-In.